The Bulldog is instantly recognizable by his broad head, wide shoulders and undershot jaw, known technically as a mandibular prognathism. They have a thickly furrowed brow, a short muzzle, drooping jowls, and pointed teeth. 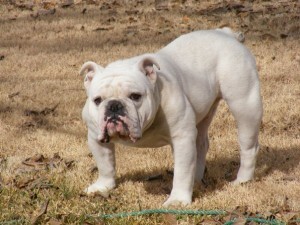 The Bulldog can come in several different colors, including fawn, white, brindle. Their fur is short and sleek against the body. Male Boxers weigh around 55-60 pounds, and females around 45 pounds. Bulldogs have naturally short tails. 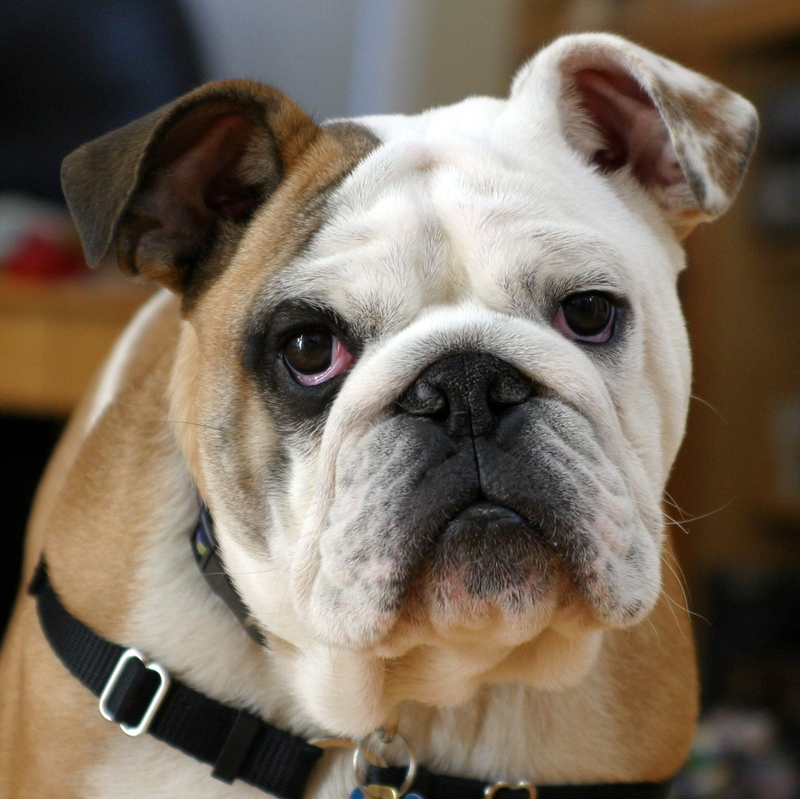 The Bulldog is an historic breed which has been a great favourite in both the US and the UK. The “British Bulldog” is term applied to the fighting spirit of the British during wartime, whilst the US Marines Corps have the Bulldog as a mascot, with a bulldog housed at many Marine barracks. The reputation for tenaciousness and aggression of course comes from the barbaric custom of dog fighting that was so prevalent in less humane times (when pet insurance wasn’t a necessity as it is now). In fact bulldogs were named after the customary sport of bull baiting, where the undershot jaw enabled the to grasp and hold onto the bull’s nose in an effort to bring it to the ground. Several dogs would be set on a bull for this sport, and the dogs gained a reputation for bravery and a refusal to give up on a fight, despite sustaining quite serious injuries. Thankfully the practice of bull baiting was outlawed in England in 1835, making the breed redundant in it’s fighting form. 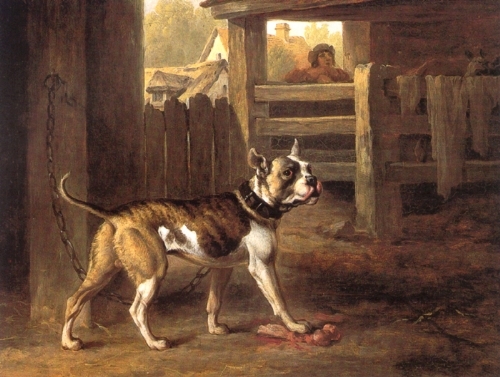 The aggression was slowly bred out of the dogs, which were adopted as pets and celebrated by the first breed club, which met at an inn on Oxford Street in London in 1878. It was here that the Bulldog Club drew up the breed standards for the English Bulldog. Americans love the breed too, which may be because of their use by early settlers upon their arrival in the New World, where they were used as working dogs who would trap bulls by the nose, allowing them to be roped and captured. Their breed standards are slightly different to that of the English Bulldog. In spite of the slightly grumpy appearance, Bulldogs are loving and docile creatures. Despite having been bred as fighting dogs, prized for their courage and imperviousness to pain, they make superb, easily socialized pets. The don’t need a great deal of exercise, although they can run quite fast if minded to do so. They can be stubborn and strong-willed if not properly trained, so start early if you buy a Bulldog puppy. The Bulldog is not the most intelligent breed of dog, and ranks near the bottom of dog breed intelligence tables. Many feel this is part of their charm, however, and what they lack in intelligence they make up for in personality. The breed specification from the American Kennel Club outlines the breed standard Bulldog’s “disposition should be equable and kind, resolute and courageous (not vicious or aggressive), and demeanor should be pacific and dignified”. This is a good representation of the best of the breed, and over the years the aggression and fighting tendency of the Bulldog has been bred out of it. They are now considered to be good with children, other dogs and extremely sociable, enjoying the company of their families and not wanting to stray far from home. In fact, so gentle is the breed now that they are not considered to be particularly good guard-dogs. Bulldogs are prone to a number of health issues, and there has been pressure to make changes to the breed standard in the light of this. One condition that is common in Bulldogs is hip dysplasia, with a high incidence reported, which you should be aware of. It may be worth discussing this with your veterinary surgeon and making sure that your pet insurance covers it. The breed also has a tendency for cardiac, and respiratory problems. They may be prone to other minor aliments, such as cysts between the toes, which can be easily removed by a veterinary surgeon. So-called ‘cherry eye’, which is a protrusion of the inner eyelid can affect Bulldogs too, but again this is a relatively minor condition which is easily treated with minor surgery should it occur. It is important to be aware of potential respiratory problems that can affect short-faced breeds like Bulldogs in hot weather. They can have difficulty with thermo-regulation, due to breathing difficulties, and must be kept cool and well hydrated. Most of their heat is actually lost from the pads on their paws, and they enjoy cool floors for this reason. The respiratory difficulties Bulldogs experience, due to their face shape, can potentially make them noisy companions. They might snort and breathe heavily, and may even snore in their sleep. Breeding from your Bulldog is not recommended, as almost 80% of puppies have to be delivered by Cesaerian section, due to the size of their heads, which can cause problems for the mother during delivery. Bulldogs have a life expectancy of between 7-12 years. If you take a little time to learn about the particular needs of this special and historic breed you will have a loyal and gentle companion, who will love your company and your family. Thanks for finally talking about > Bulldogs – Your Own Vet < Loved it! My male Pitt bull has bags underneath his eyes but he acts perfectly healthy. Whats wrong?.